1. In a small saucepan, over medium-high heat, combine cream and thyme. Cook, stirring frequently, until mixture starts to simmer. Remove from heat and let sit covered for 15 minutes. 2. Strain cream to remove thyme and return to saucepan. Stir in honey and salt and cook over medium-high heat until cream mixture comes to a rolling boil. 3. Place chocolate chips in a medium bowl. Pour cream mixture over chocolate chips and let sit for 2 minutes. Stir until all chocolate is melted and mixture is smooth. 4. Add butter to warm chocolate mixture and mix well. Place in refrigerator for 1-2 hours until firm. 5. 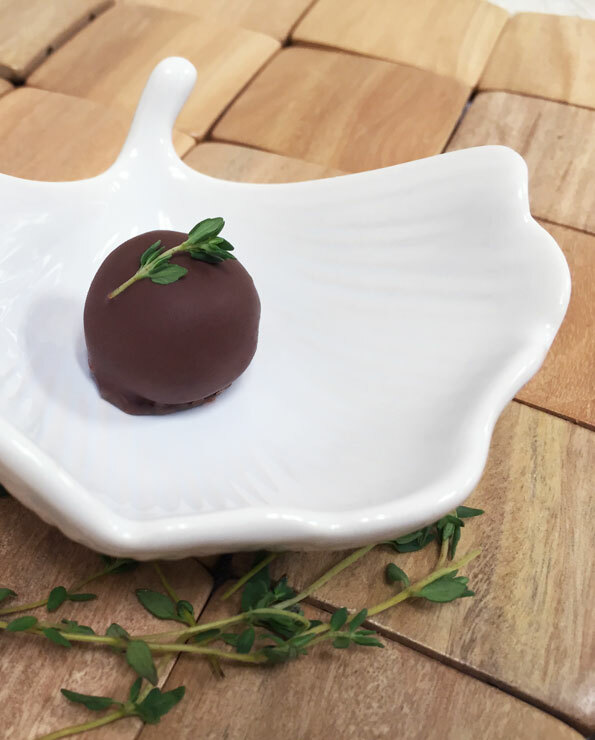 Using a teaspoon, roll ganache into 1-inch sized balls. Return to the refrigerator and chill until firm. 6. Melt CANDIQUIK® Coating in Melt & Make™ Microwaveable Tray according to package directions. 7. Dip ganache balls in melted coating; allow excess coating to drip off. 8. Place on wax paper, garnish with fresh thyme, and allow to set completely.